This oil is made from Pink Kush flowers grown on Vancouver Island, in beautiful British Columbia! 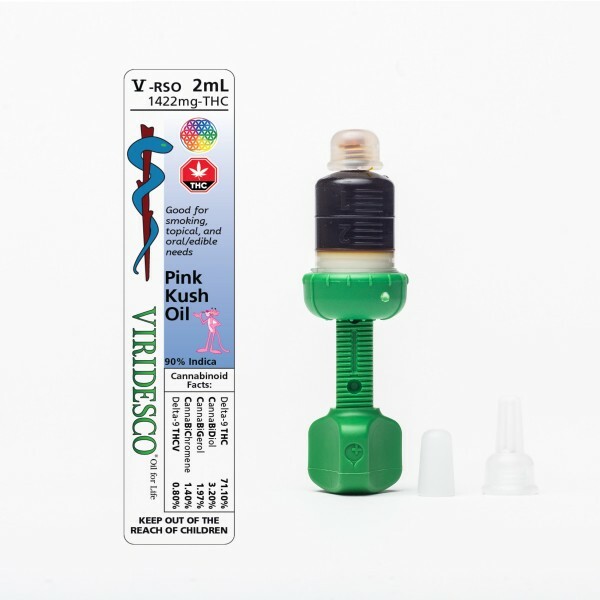 Pink Kush - 2ml (Indica) 2ml dispenser 1422mg THC (90% Indica) This high-end RSO has been independently tested at MB labs to contain over 79.11% cannabinoids, including 71.10% THC! Rank Canabinols %Value 1 Delta-9 THC 71.10 2 CannaBiDiol 3.20 3 CannaBiGerol 1.97 4 CannaBiChromene 1.40 5 Delta-9 THCV 0.80 This oil is made from Pink Kush flowers grown on Vancouver Island, in beautiful British Columbia! Creating super strong body effects and a sweet and delicate taste, Pink Kush is a 90% Indica-dominant hybrid with a little bit of a coy attitude. Almost good enough to eat, the flavour and odour are heavily accented with vanilla, sweet berries, and floral notes that linger in your mouth in a pleasing way. When it comes to getting high, Pink Kush brings relaxation with a twist of happy giggles. Users will find that they are instantly taken to a euphoric headspace, as even the potential of a negative thought is far from the mind.